Retroactive has signed on three new clients, Biogen, Jawitz Properties and Cricket South Africa, and has gone live with campaigns for the brands. 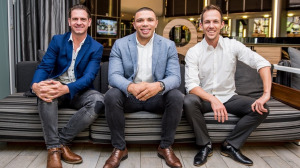 The creative sports marketing agency was launched in October by Springbok Bryan Habana, Mike Sharman, Ben Karpinski and Shaka Sisulu. "The market has welcomed Retroactive’s disruptive and fresh approach to digital sports marketing with open arms," says Sharman. "The already profitable agency is achieving exceptional, measurable results for its clients, and we look forward to working with more sport and fitness brands and sporting personalities who want to change the digital sports marketing game for the better," Sharman adds. The Biogen campaign films and shares the '#BiogenJourney' of James Hobson, or ‘Hobbo’, a South African man who weighs 130kgs and who will attempt to complete the IRONMAN 70.3 in Durban in June 2019. While documenting Hobbo’s journey and sharing his learnings and experiences, the campaign also encourages South Africans to share their own journeys to '#BeYourBest' with Biogen. Since he started his '#BiogenJourney' in September, Hobbo has lost 17kgs, dropped 4.8% in body fat and 3.3 points in his Body Mass Index (BMI). The campaign has reached 1.3 million South Africans to date: 90 000 views of the fortnightly video diaries, more than 1 000 engagements and over 6 500 downloads of the podcast content. "I was in the worst shape of my life when I started my '#BiogenJourney', but the programme’s holistic approach to nutrition, exercise and vitamin supplements is inspiring me to continue – just as I hope my journey is inspiring other South Africans to join me on a journey to health," says Hobbo. Brandon Fairweather, marketing manager, Biogen South Africa, says that documenting Hobbo’s journey over nearly a year will show South Africans that the path to real health is not an overnight quick-fix, but should rather be a holistic lifestyle strategy. "The traction we’re gaining for the brand working with Retroactive is nothing short of incredible," he says. In its work with Jawitz Properties, Retroactive is seeding content for a campaign led by South Africa’s favourite footballer Lucas Radebe, which asks South Africans to share their '#RealLifeRealEstate' story. Lucas starts the campaign by sharing what made his childhood home special and encourages South Africans to share their own digital story about their dream home. The campaign aims to identify people who need help the most with their property dreams this festive season, and culminates with weekly prizes for stories and grand prizes won on regional radio stations before the end of the year. The campaign for Mzansi Super League sees Habana, Sharman and Karpinski share their ideas and dreams of the ideal fan experience with Cricket South Africa. Retroactive has supported the launch of the Mzansi Super League with online content and stories that aim to connect fans and would-be fans via digital and TV content in the hopes of driving more feet into cricket stadiums across the country. "We’re blown away by the overwhelmingly positive response that Retroactive has received over the past few weeks, and with R1.5-million turnover already secured, the agency’s ability to further disrupt conventional sports marketing to achieve outstanding results for brands is crystal clear," Sharman says. For more information, visit www.retroactive.digital. You can also follow Retroactive on Twitter or on Instagram.